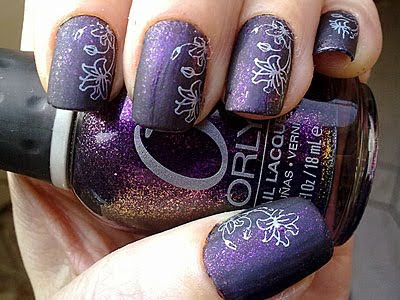 Gone for some Orly Out of this World today because of the purple shimmery fabulousness. My favouritist purple in the whole wide world. I wasn't paying attention and mattified and Konadified my left hand before I took a picture, so the shaky-cam picture above is of my right hand, but you get the general idea of the colour. The yellow duochrome you see on the bottle doesn't really show up when on the nails which is a bit of a bummer. It still looks bloody nice, though. Here it is mattified with Mavala Matt Top Coat (a 99p Fleabay bidding bargain, it's nearly a tenner elsewhere) and, yet again, the picture does not do the colour justice, it has a lovely velvety texture that makes me go mmmmm. It did look a bit boring after a while, and I was fidgety, so I stamped over it with MUA Shade 11 using Konad plate m36 and then it was all good.